Perdido Sun is fun! 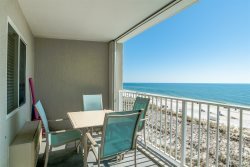 All units are located directly on the beach with large balconies. Indoor and outdoor pools, hot tub, exercise room, volleyball, Coach's snow cones and summer cookouts! 1 Bedroom, 1.5 Bath, 2 Bedroom, 2 Bath and 3 Bedroom, 3 Bath units are available. Located directly across the street from Villagio Shopping Village, you can sun by day and play by night.